ROBOT ATHLETE CUP 2012 JAN in HAMAGIN SPACE SCIENCE CENTER took place in Yokohama on Jan 29, 2012, which was sponsored by HAMAGIN SPACE SCIENCE CENTER and ROBOT ATHLETE CUP Executive Committee. The purposes of ATHLETE CUP are development of robot technology and activation of robot market by providing robot builders and students with a place for exchanging information. MANOI by KYOSHO, KHR series by KONDO KAGAKU CO., LTD. and Himejisoftworks Zero series which were on the market could join the competition. Revised these robots also could join. Twenty robots joined 5 athletic competitions which were Dancing, Free Performance, Autonomous Beach Flag, Autonomous 20 m Foot Race and Radio Controlled 5 m Foot Race. Each competition winner got prize, twenty thousands yen except for Radio Controlled 5 m Foot Race (as Exhibition Race). Competitions were carried out on the athletic field which was 7 m length and 1.8 m width punchcarpet (needlecarpet). Results are shown in Robot Yuenchi Blog. Four robots joined the competition. Each robot could run the 5 m course twice. The robot taken the best record was winner. 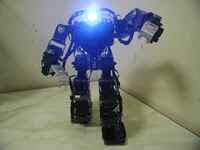 The winner was BLACK TIGER β, KHR-1 revised robot by IKETOMU　which best record time was 28.47 seconds. Dr. GIY's robot took 11.78 seconds, however he didn't have the right to get winner because of his excellent robot and skill. Video is each robot's best records of twice run. Robot Beach Flag game is similar to human's one. Two robots start from start line and push down the pole sat at a distance of 5 m. The robot push down the pole at first is winner. The pole (for beach flag) is attached with 40kHz ultra sonic wave sender. As radio control is prohibited, all robots have to move autonomously. There is no limitation concerning sensor control board and sensors. Six robots joined to the competition. Tokai University KHR3B vs Tokai University KHR4B. 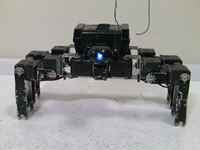 Each robots was using KCB-3WL for color image sensing of the pole color red. Tokai University KHR3B was using KCB-3WL for color image sensing of the pole color red. Iso-Ko Gardian vs Tokai University KHR4B. The winner was `Iso-Ko Gardian`(Isoko Technical High School), using RCB-1 as sensor control board with ultrasonic wave sensors (USW) and PSD sensors. When the robot start, the USW sensor system was used and when the robot was in the short distance from the pole, the PSD sensor system was used. On the other hand, Tokai University KHR4B detected the pole red color out of the course and lost the pole. It seemed to be necessary to remove the detect color around the course strictly when using of color sensing system. Tokai University KHR3B; Robot turned by color marker using KCB-3WL for color sensing. Kanagawa University Robot; Robot turns by radio wave sender. Tokai University KHR4B; The winner of the competition. Robot turned by color marker using KCB-3WL for color sensing. ROBOT ATHLETE CUP Executive Committee announced that Multi-Legged ROBOT ATHLETE CUP as same as biped robot, also will take place one day in next May. Demonstrations of Beach Flag were carried out by 4-legged robot using ultrasonic wave sensors and PSD sensors. website post page to all mу сontacts, sіnce if like to reаd it then mу contacts ωill too.